Cold symptoms usually begin with a sore throat, which usually goes away after a day or two. Nasal symptoms, runny nose, and congestion follow, along with a cough by the fourth and fifth days. Fever is uncommon in adults, but a slight fever is possible. Children are more likely to have a fever with a cold. With cold symptoms, the nose teems with watery nasal secretions for the first few days. Later, these become thicker and darker. Dark mucus is natural and does not usually mean you have developed a bacterial infection, such as a sinus infection. Several hundred different viruses may cause your cold symptoms. How long do cold symptoms last? Cold symptoms usually last for about a week. During the first three days that you have cold symptoms, you are contagious. This means you can pass the cold to others, so stay home and get some much-needed rest. If cold symptoms do not seem to be improving after a week, you may have a bacterial infection, which means you may need antibiotics. Sometimes you may mistake cold symptoms for allergic rhinitis (hay fever) or a sinus infection. If cold symptoms begin quickly and are improving after a week, then it is usually a cold, not allergy. If your cold symptoms do not seem to be getting better after a week, check with your doctor to see if you have developed an allergy or sinusitis. Flu symptoms are usually more severe than cold symptoms and come on quickly. 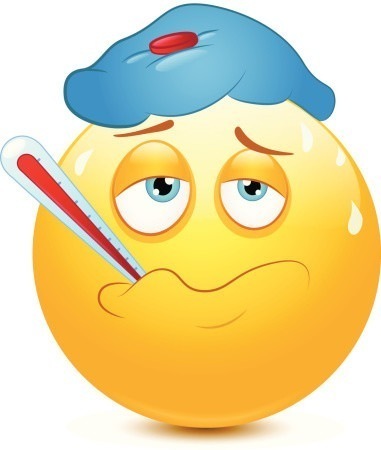 Symptoms of flu include sore throat, fever, headache, muscle aches and soreness, congestion, and cough. Swine flu in particular is also associated with vomiting and diarrhea. Most flu symptoms gradually improve over two to five days, but it’s not uncommon to feel run down for a week or more. A common complication of the flu is pneumonia, particularly in the young, elderly, or people with lung or heart problems. If you notice shortness of breath, let your doctor know. Another common sign of pneumonia is fever that comes back after having been gone for a day or two. Just like cold viruses, flu viruses enter your body through the mucous membranes of the nose, eyes, or mouth. Every time you touch your hand to one of these areas, you could be infecting yourself with a virus, which makes it very important to keep hands germ-free with frequent washing to prevent both flu and cold symptoms. Is it flu or cold symptoms? How do you know if you have flu or cold symptoms? Take your temperature, say many experts. Flu symptoms often mimic cold symptoms with nasal congestion, cough, aches, and malaise. But a common cold rarely has symptoms of fever above 101 degrees. With flu symptoms, you will probably have a fever initially with the flu virus and you will feel miserable. Body and muscle aches are also more common with the flu. This table can help determine if you have cold or flu symptoms. Treatment Decongestants; pain reliever/fever reducer medicines Decongestants, pain relievers, or fever reducers are available over the counter; over-the-counter cough and cold medicines should not be given to young children; prescription antiviral drugs for flu may be given in some cases; call your doctor for more information about treatment. Usually, the time of year will give you some sense of what you’re dealing with. The standard flu season runs from fall to spring of the next year. When do I call the doctor with flu or cold symptoms? Persistent fever: A fever lasting more than three days can be a sign of another bacterial infection that should be treated. Painful swallowing: Although a sore throat from a cold or flu can cause mild discomfort, severe pain could mean strep throat, which requires treatment by a doctor. Persistent coughing: When a cough doesn’t go away after two or three weeks, it could be bronchitis, which may need an antibiotic. Postnasal drip or sinusitis can also result in a persistent cough. In addition, asthma is another cause of persistent coughing. Persistent congestion and headaches: When colds and allergies cause congestion and blockage of sinus passages, they can lead to a sinus infection (sinusitis). If you have pain around the eyes and face with thick nasal discharge after a week, you may have a bacterial infection and possibly need an antibiotic. Most sinus infections, however, do not need an antibiotic. Can I prevent flu or cold symptoms? The most important prevention measure for preventing colds and flu is frequent hand washing. Hand washing by rubbing the hands with warm soapy water for at least 20 seconds helps to slough germs off the skin. In addition to hand washing to prevent flu or cold symptoms, you can also get a flu vaccine to prevent seasonal influenza. Seasonal flu activity in the United States generally peaks between late December and early March. Within two weeks of getting a flu vaccine, antibodies develop in the body and provide protection against flu. Children receiving the vaccine for the first time need two doses delivered one month apart. Antiviral medicine may also help prevent flu if you have been exposed to someone with flu symptoms. Previous post: Some Good Comes from Hawaii’s False Alarm.